Search engine optimization, or SEO, has to do with keywords. Some people spend a great deal of time on keyword research (which you should) and then fail on the next step of implementing the keywords into their website. The first and foremost goal you should have is to create a website that offers critical information and valuable content to the reader. Beyond anything else, you want the visitor to your site to be able to react to the information you provide. This is one of the main reasons some owners put too many keywords into their website. One of the ways that you can ensure you are getting the best possible results from your SEO usage is to use the right keyword density. Some website developers and gurus believe that you should not focus on keyword density, which is the number of keywords used in the content of the website compared to the other words used. It is true that you should have a well designed layout and content that is very helpful to the reader above anything else. However, many website owners feel the importance of having a number to work towards. You can use a keyword density as a guideline for your website’s content, but you want to keep that density low. There is no benefit to adding too many keywords to your website. If you do so, you will only confuse readers with poorly worded website content and you will drive the search engines away. The days of keyword stuffing web pages are long gone and today search engines can actually detect quality content. Therefore, you are not doing yourself any favors by including too many keywords on a page, no matter how relevant they are for your website itself. 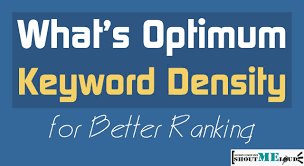 Keyword density should always be as low as is possible with a maximum goal of two percent. If it is higher than that, chances are good that you will have awkwardly worded text that does not fulfill the needs of the reader, who is the person that you are building the website for, after all. Quality content should be your first goal. From that point, you can use density as a way of telling you if you are meeting the minimums without overtaking the highest usage of keywords at the same time. Focus on choosing the right keywords and creating quality and readable content for your readers.